Burgess Gate is a late 13th century stone two storey gatehouse, founded by Henry de Lacy, earl of Lincoln. Flanking the north side of the town walls, it was the principal entrance to Denbigh medieval town, the other entrance being the Exchequer Gate. 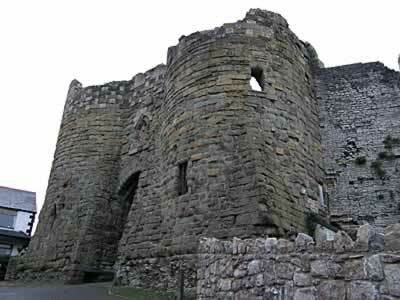 Built simultaneously with Denbigh Castle in 1282-95, it was possibly designed by master mason, James of St George, the leading military architect of his day. The vaulted vehicular entrance is flanked by twin round towers, which rise from rectangular bases with pyramidal spurs. The interior passage was originally defended by a ditch, crossed by a bridge, a portcullis, a pair of doors and sets of murder-holes in the vault. Above the gate are two first floor chambers, with a single triangular-headed window and chequer-work decoration to the fore.